Sallie B. Goodman was reunited with her husband Reverend James H. Goodman on January 19, 2019 at the age of 86. Sallie was born August 19, 1932 in Caledonia, Mississippi and was a resident of Crescent City, California for over 60 years. 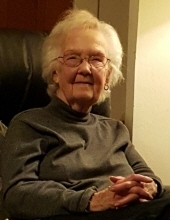 Sallie is remembered as being a caring wife and mom – while also serving as a faithful pastor’s wife throughout James’ 50 plus years’ ministry in Del Norte County. At the time of her death Sallie was a member of the Crescent City First Baptist Church. Sallie was preceded in death by her husband of 59 years James, her parents and her four sisters and one brother. Sallie is survived by her sons James Goodman (Vicki) and Tim; grandchildren Jonathan Goodman, Sarah Perreault (Mark) Bekah Frisk (Jeremy), Josh Goodman, Drew Goodman, Alexa Goodman, Aubrey Goodman, and fourteen great-grandchildren. Private committal will take place after the funeral. To plant a tree in memory of Sallie B. Goodman, please visit our Tribute Store. "Email Address" would like to share the life celebration of Sallie B. Goodman. Click on the "link" to go to share a favorite memory or leave a condolence message for the family.